The department’s greenhouse is located on the roof of the ISC, on the third floor accessible from ISC 1. The variety of greenhouse plants represents the range of plant families, providing living examples of pantropical species. 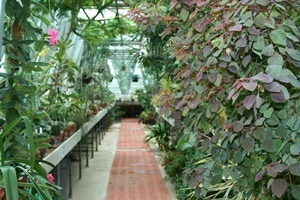 The greenhouse also houses student and faculty research projects, and staff members grow plants used in botany laboratories. The Greenhouse Director is Associate Professor of Biology Martha Case.